Rackmountable, Easy to Use, and It Sounds Awesome! The Yamaha TF-Rack rackmount digital mixer is so easy to use, it's downright inspiring! Respond to the music onstage with effortless speed and freedom, by virtue of the TF-Rack's fluid TouchFlow Operation. For experienced engineers and novices alike, the TF-Rack's level of refinement is nothing short of astonishing, which makes achieving a great mix a piece of cake. And after listening to the TF-Rack's great-sounding D-Pre mic preamps, we think you'll agree that this comfortable, smooth-operating rackmount digital mixer doesn't skimp on sound quality either. Thanks to its straightforward touchscreen design and practical presets and scenes, the Yamaha TF-Rack is a truly evolved rackmount digital mixer. Smooth and refined, the Yamaha TF-Rack's TouchFlow Operation provides you with straightforward control that never stands between you and your music. At Sweetwater, we've found that the user interface on the TF-Rack's built-in touchscreen gives you easy, direct accessibility, with a layout that promotes natural, efficient mixing. A physical Touch & Turn knob right beside the touchscreen makes extra-precision adjustments a breeze. The Yamaha TF-Rack is probably one of the least intimidating digital consoles in existence, thanks to its incredibly practical presets and scenes. Working with microphone manufacturers such as Audio-Technica, Sennheiser, and Shure as well as respected engineers, Yamaha has created a range of shortcuts to great sound that are effective in all kinds of situations. If you're a novice engineer, the TF-Rack's presets will achieve a great mix without a bunch of tweaking. On the other hand, if you're an experienced engineer, you'll appreciate the significant time savings provided by having useful starting points instantly available to you. On top of that, you get two banks of scene memory (for a total of 200 scenes), that set up and instantly recall all of your settings for nearly any scenario. You even get pre-programmed scenes to get you started! Gain, compressor, and EQ setup is child's play with the Yamaha TF-Rack. Whether you're an experienced FOH engineer or volunteering to run sound for a worship service, the TF-Rack's simplified 1-knob operation lets you adjust compressor and EQ settings with confidence. With a simple twist of a knob, you can use a compressor to bring a guitar to life, add punch to bass, tighten up a snare, and make vocals ride clearly on the mix. 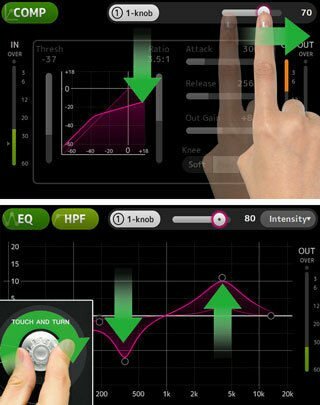 On top of that, the TF-Rack's finely tuned EQ quickly achieves outstanding results with minimal effort. You also get a Vocal Mode for clear, well-defined vocals, and an Intensity mode for simplified control over EQ curves. Finally, the TF-Rack's GainFinder optimizes your gain setup so you can achieve Grade-A sound quality with little effort. The mic preamps play a significant role in defining the sound of your mix, which is why the Yamaha TF-Rack is loaded with 16 of their acclaimed D-Pre mic pres. Utilizing a circuit based on a discrete inverted Darlington configuration, D-Pre preamps provide you with a clean, precise sound that captures every nuance and subtlety of your source. The pure sound of these pres ensures that you won't need to spend hours EQing just to get a barely acceptable sound, like you would with low-quality mic preamps. You also get eight powerful processors, providing you with wide-ranging sonic control. In addition to the EQ and dynamics processors on each channel, you also get 19 programs based on Yamaha's world-famous SPX processors, ranging from reverb and delay through modulation effects to multiband compression. The TF-Rack's aux buses and output channels feature both parametric and graphic EQs, making speaker optimization and feedback elimination a piece of cake. A trio of dedicated apps makes offline editing, wireless mixing, and personal monitor mixing a breeze. 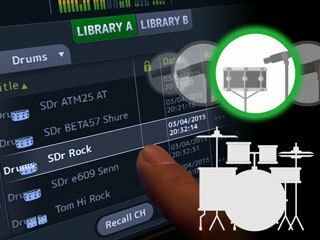 Utilizing a Mac or PC, TF Editor provides complete offline editing and setup of the Yamaha TF-Rack. You can also use TF Editor when your mixer is online. Your multi-touch screen-equipped PC can use the same gestures as the console itself, and it can also function as a remote mixing device via Wi-Fi. Load TF StageMix on your iPad to mix from anywhere. Work from the audience position, in front of floor monitors, or onstage to ensure that every inch of the venue sounds great. TF MonitorMix works with your iOS device, allowing up to 10 musicians to create their own personal monitor mix.